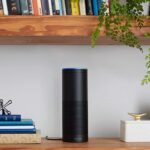 Welcome to the SmartHomeBeginner smart home News Roundup 2017 Wk 38. This week saw Nest unveil home security products, rumors of Amazon smart glasses, and Amazon dominating the smart speaker space. Read on for the latest in smart home news and updates! While Google is a renowned tech player, not all of its ventures have been met with great success. Remember the Google Glasses? Those failed and saw little adoption. However, Amazon appears poised to unveil a pair of smart glasses as well as a new security camera. Fittingly, Amazons rumored camera and glasses will feature Alexa integration. As Investors.com reports, these Amazon gadgets directly compete with Google's Alphabet array of virtual assistants. It will be interesting to see if Amazon can make traction with a pair of smart glasses. Though a neat concept, the practicality is questionable. If Google couldn't pull it off, that speaks volumes. Nevertheless, if there's anyone capable of succeeding where Google can't, possibly it's Amazon. In Chocktaw, OK, a former Air Force cybersecurity expert has taken his tech expertise to a new realm: the smart home space. Princeton Wilson runs Legacy Construction & Development, which has built over 50 houses, specializes in high-end smart home creation. Its abodes range from $200,000 to $1 million. Inside, you'll find everything from typical smart home fare such as Nest smart thermostats to water heaters, and even motion-activated flood lights. This proves that there's not only money to be made in the smart tech space, but by creating smart homes as well. Electronics retailer Best Buy debuted a major overhaul of its tech plan. Dubbed Best Buy 2020, CEU Hubert Joly plans to focus increasingly on smart homes, in-home tech support, and senior-oriented assisted living. At the end of Oct. 2017, Best Buy aims to provide smart home shops in over 1,000 stores. With more smart home devices hitting shelves and accordingly lower prices on connected tech, this seems a logical move for the electronics vendor. Amazon's retail stores, as Adage allows, focus on smart tech like the Echo. Plus, even Kohl's jumped into the smart home game by setting up smart home shops in several of its stores through a partnership with Amazon.